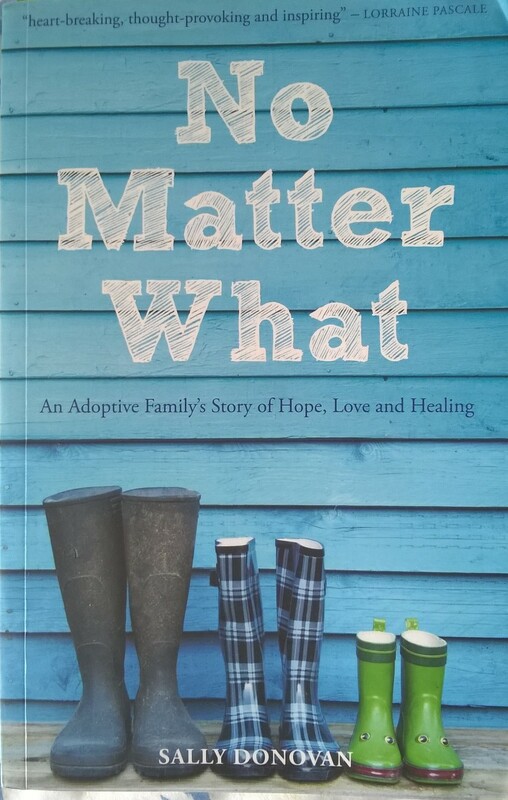 “No Matter What” by Sally Donovan is subtitled “An Adoptive Family’s Story of Hope, Love and Healing”. It was published in 2013 and tells the story of Sally Donovan and her husband Rob who adopted two children, aged 4 and 1 in 2002. Tl;Dr: This was a wonderful book that I strongly recommend to prospective adopters and even their friends or family. 9/10. This book tells a true story, although names/places have been changed for obvious reasons. The story starts with an interaction between Sally and her son Jamie where he remembers having a tooth knocked out. Then it goes back to Sally and Rob’s years of attempting to have a baby and dealing with infertility. If you want to skip that, and just start at the point at which Sally and Rob decide to pursue adoption, start at the bottom of page 49 (a couple of pages before Chapter 4, if you have a different edition of the book). I won’t give a play-by-play of this book — it covers their adoption journey from infertility to finding out about therapeutic parenting about 7 years after their children are placed with them. This isn’t the best book to read if you want to know how the adoption process works, as this adoption took place more than a decade ago and there have been many changes in adoption law and practice since then. That said, this is a very good book to get the ‘feel’ of adoption and to really get a sense of the emotions throughout every step of the process. The author and her husband got very little post-adoption support for several years after their children were placed. They did eventually get a post-adoption worker who seemed to have training in attachment issues and therapeutic parenting. I believe that most LA’s and VA’s understand the importance of post-adoption support now. The agency that Hubby and I are with promises post-adoption support for their adopters. I think that we even will have the same social worker who is doing our Home Study as our post-adoption support worker. That means we have an experienced person who is there to help us after our children come. This book was so engrossing that I couldn’t put it down! I confess that I read it over a weekend. The author of this book has written another one, entitled “The Unofficial Guide to Adoption” which was published recently. Hubby is reading it now, but I’m looking forward to reading it.